This week’s about knowing when it’s a low risk time to buy gold stocks. One… The S&P 500 has soared to record heights as the economy came out of the housing crisis dungeon. Two… Gold stocks, plus other commodities went into the dungeon due to a multi-year bear market in commodities. Since both things have been taking place for almost a decade now, it’s time to take advantage of good old reversion to the mean. In short, a new gold bull market started to take place in early January 2016. Gold stocks soared, along with the price of oil, when most commodities bottomed out in early 2016. The good thing is that you didn’t miss out. You still have a great opportunity to buy gold stocks. The easiest way to get exposure is via an ETF like VanEck Vectors Gold Miners ETF (GDX) or VanEck Vectors Junior Gold Miners ETF (GDXJ). GDX holds the larger-cap, more mature companies. GDXJ holds a basket of smaller-cap gold companies primarily involved in mining for gold… The kind that carry more risk but that will see much bigger moves (Maybe 2,3, 5, or 10 times as much as a large-cap gold stock) when the price of gold goes up. One of the best indicators for knowing when it’s a low-risk time to buy gold stocks is the gold/silver ratio. It’s just the spot price of gold divided by the spot price of silver. The blue arrows show the start of each previous gold bull market over the past 20 years. The green arrow shows that the current bull market has taken a breather. Which means it’s an opportunity for those who missed the boat back in early 2016 to get in. The next chart tracks the price of gold over the same time-period. Each blue arrow points to the price of gold when the ratio was at 80. As you can see, the price of gold saw big gains each time. The red arrows point to the price of gold when the ratio dropped to around 45. Which is when gold went into correction mode. The big gold bull market that ended in 2011 went well below 35. Now, the reason to buy gold stocks (as opposed to physical gold) is because it’s a way to magnify your returns. For example, ABC Gold produces gold for $1,000 per ounce. If the gold price is $1,300 when it sells its gold, it makes a $300 profit on every ounce. The company’s earnings are calculated from that $300 profit. Of course, this is assuming the company doesn’t have any financial issues. Let’s say the gold price rises to $1,500. Now it has a $500 per ounce profit ($1,500 – $1,000 = $500). But look at what happened to its profit: it grew by 67%…while the price of gold only increased by 15.4%. Think about this for a moment… The company’s profit went up $200 per ounce, from $300 to $500 and it didn’t do anything different. That’s with a 15% jump in the gold price. Hardly a massive bull market in gold. If gold rises to $2,000, it’s profit would soar 233% from $300 per ounce to $1000 per ounce. That’s why it pays to have an allocation to gold in your portfolio. Because when the stock market tanks, the dollar tends to tank, which means the price of gold tends to go up significantly. When stock markets are in complete chaos, investors run to gold for safety. The outsized returns you get from the move up in gold soften the blow from the drop in stocks. Depending on your allocation you could actually see nice gains in your portfolio. Ok…. Now back to what I said in the beginning. I told you we’ve had two things happening over the past several years. The stock market going up. Gold and commodities going down. As you can see, the S&P 500 is up 290% since March 2009 when the stock market bottomed as the worst of the financial crisis faded. GDX and GDXJ are now down close to 30% and 60% respectively. You can see them start to take off in early 2016 when the new gold bull market began. But they have cooled off since then. Therefore, investors still have the opportunity to get in on the next gold bull market and to do so at good prices. As I mentioned earlier, GDXJ will offer the chance at bigger returns than GDX. Simply because it’s comprised small-cap gold mining stocks. The good thing is that by buying the ETF, it helps eliminate the bankruptcy risk or other company-specific risk you face when you buy just one or two. 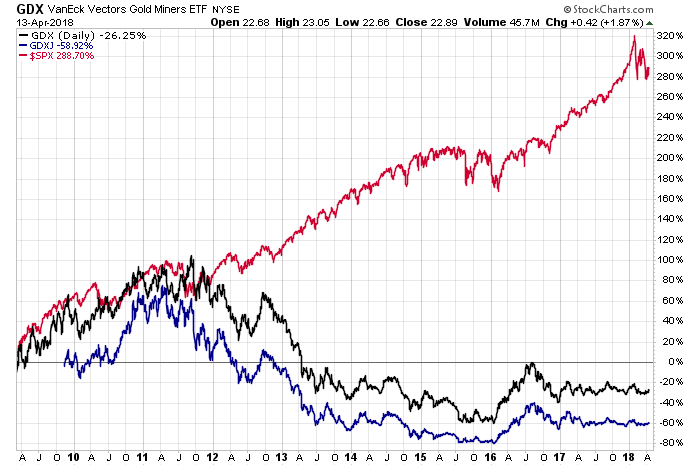 The bottom line, unless your plugged into what’s happening in the world of gold stocks (this can be said of stocks in general too), the ETF is a great way for the individual investor to take advantage of the coming gold bull market over the next 3-5 years. Chad Champion is the Founder and Chief Investment Strategist at The Champion Investor. . The Champion Investor is focused on helping investors navigate the global markets, find undervalued investment opportunities, and create a second income stream using options. You can sign up for The Champion Investor’s Global Research & Strategy Notes for free here. Chad has a Finance and Investment Management background with a Master’s Degree focused in Investment Management and Financial Analysis and a Masters of Business Administration focused in Financial Management. He spent the past couple of years working as the lead analyst at Casey Research and as a research analyst for Bill Bonner at Bonner and Partners.